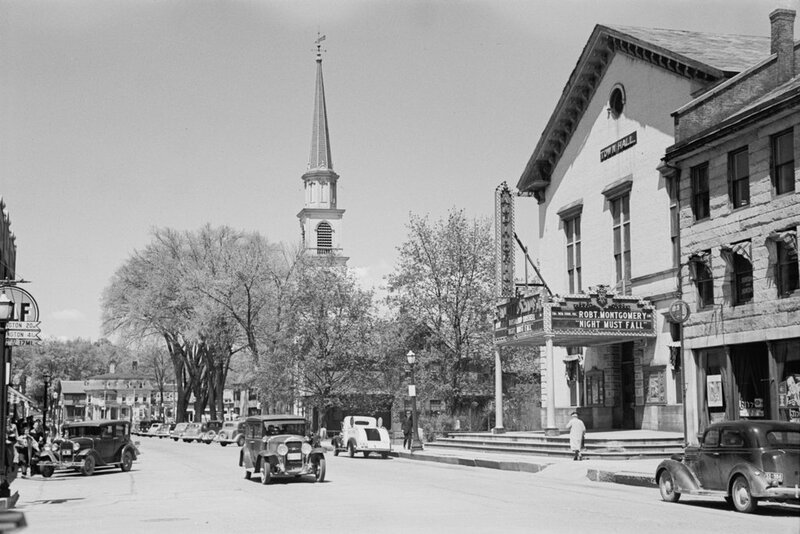 The town hall on Main Street in Brattleboro, seen from the corner of High Street in May 1937. Image taken by Arthur Rothstein, courtesy of the Library of Congress, FSA/OWI Collection. 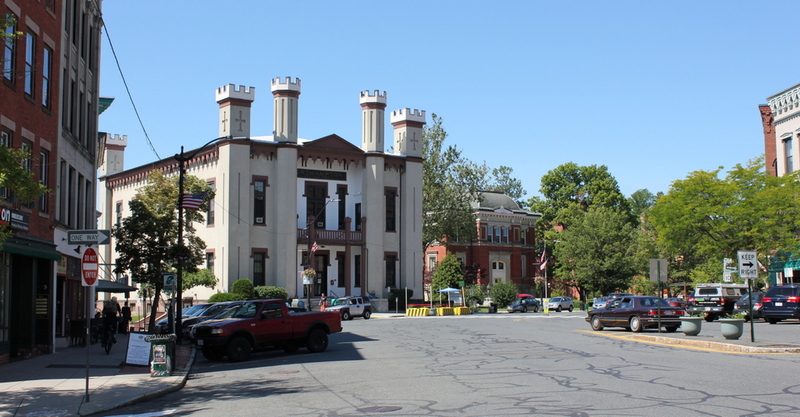 As mentioned in the previous post, the old Brattleboro town hall was built in 1855, and over the years it was used for town offices and town meetings, but it also housed the library, police department, post office, and county clerk’s office, along with several different commercial tenants. The meeting hall was also used for concerts and other performances, and in 1895 the building was expanded with the addition of an auditorium that was originally known as the opera house. The building hosted a number of notable speakers throughout the late 19th and early 20th centuries, including Henry Ward Beecher, Frederick Douglass, Horace Greeley, Oliver Wendell Holmes, and Mark Twain. 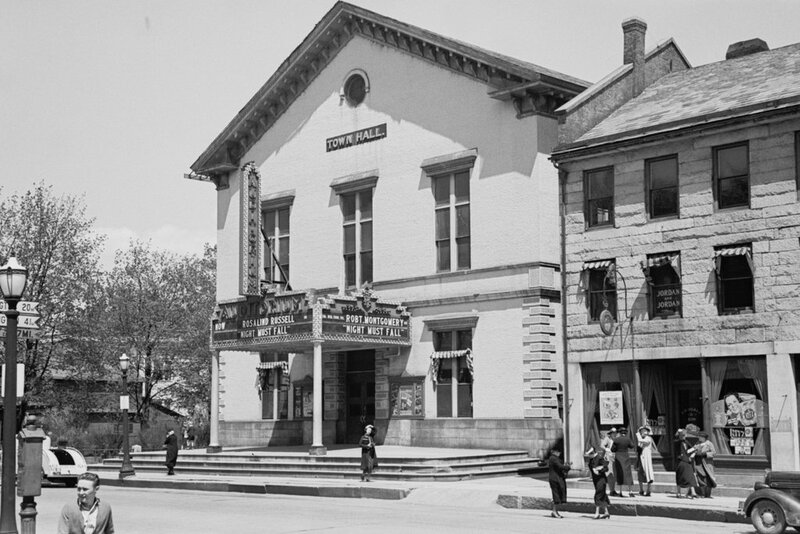 During the early 20th century, movies began to eclipse live performances in popularity, and by the 1920s the opera house in the town hall was converted into a movie theater, known as the Auditorium. The first photo, taken in 1937, shows the front entrance of the building, the the marquee advertising Night Must Fall, starring Robert Montgomery and Rosalind Russell. At the time, the Auditorium was the only movie theater in town, following the a March 15, 1937 fire that destroyed the Princess Theatre on Elliot Street. However, it would soon face new competition from new, modern theaters. Later in 1937, the building next door on the right side of the photo was converted into the Paramount Theatre, and a year later the Latchis Theatre opened a little south of here on Main Street. This new competition hurt the older Auditorium, which entered a steady decline in the following years. The building continued to be used as the town hall during this time, but in 1951 the town offices were moved to the old high school building, located just north of here on Main Street. The old town hall was mostly demolished two years later, and a W. T. Grant department store was built on the site. However, parts of the exterior brick walls of the town hall were left standing, and were incorporated into the new one-story building. Part of the old wall can be seen on the right side of the building in the present-day photo, with light-colored bricks that contrast with the darker bricks of the front part of the building. 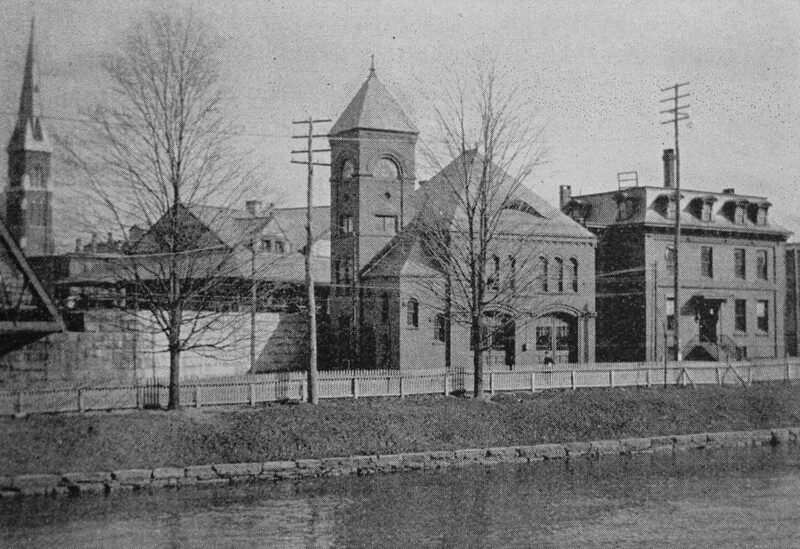 The old town hall on Main Street in Brattleboro, around 1894. Image from Picturesque Brattleboro (1894). The Brattleboro town hall was built here on Main Street in 1855, and served a wide variety of roles during its 98 years of existence. Aside from the town offices, this building housed the police department, post office, county clerk’s office, and library, and its hall was used for town meetings, concerts, theatrical performances, and other public events. 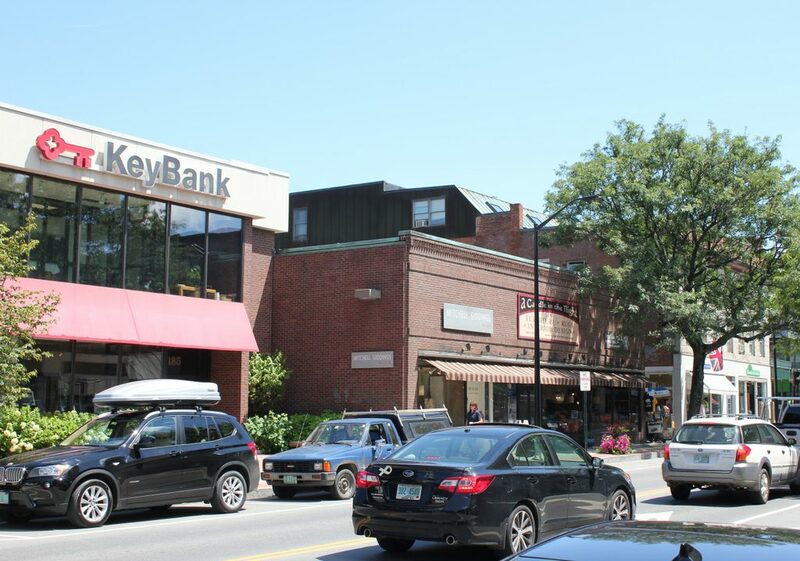 The town also rented space in the building to private tenants, and over the years these included a bookstore, a dry goods store, and lawyers’ offices. Another tenant was William Morris Hunt, a prominent artist who had lived across the street from here as a child in the 1820s and early 1830s. He subsequently spent many years in Europe, but returned to Brattleboro for about a year in 1856, living in his old boyhood home and renting studio space here in the town hall. The first photo was taken around 1894, nearly 40 years after the building was completed. The town hall had not changed much at that point, but about a year later it underwent an extensive renovation and expansion, which added an 875-seat opera house to the building. Like the original meeting hall in the building, this opera house was used for a variety of live performances, but by the early 1920s it had been converted into a movie theater, known as the Auditorium. Over the next few decades, though, the theater steadily declined, especially as newer, purpose-built movie theaters opened in downtown Brattleboro. In 1937, the building just to the right of the town hall was converted into the Paramount Theatre, and a year later the Latchis Theatre opened a few blocks to the south. In the meantime, the building remained in use as the town hall until the early 1950s. However, in 1951 a new high school building opened in the southern part of town, leaving the old downtown school building vacant. The school was then converted into town offices, and the old town hall was sold. It was mostly demolished in 1953, although some of the exterior walls were left standing and were incorporated into the W. T. Grant department store, which was built on this site. This store is now long gone, but the one-story building remains, and still has some of the original walls of the town hall. Aside from these walls, the only other surviving feature from the first photo is the building on the far right. 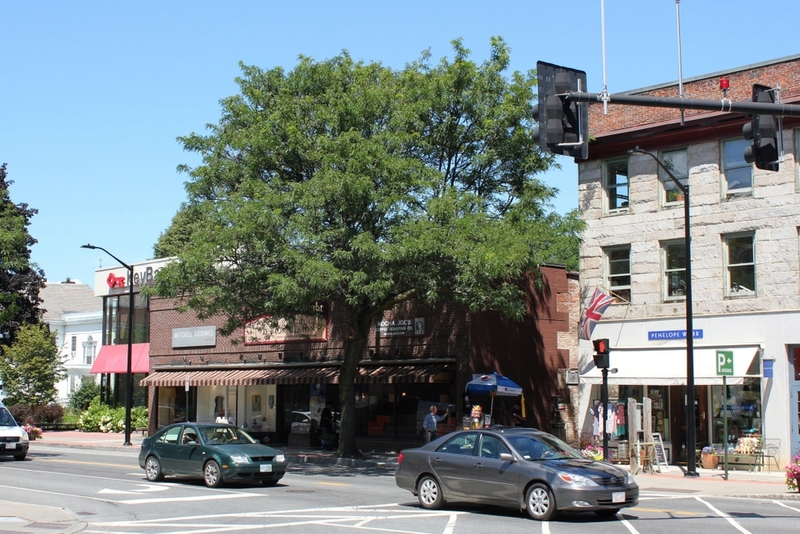 Built around 1850, this commercial block is distinctive for its Main Street facade, which is made of granite blocks. The building was substantially altered when it was converted into the Paramount Theatre in 1937, including a large addition to the rear, a flat roof to replace the original gabled roof, and metal panels that covered the granite exterior. The building was gutted by a fire in 1991, but it was subsequently restored and is still standing today. Now that it no longer has the metal panels or the theater marquee, it looks more like its original appearance than it did for most of the 20th century, and despite the many changes it is still recognizable from the first photo. Looking north on Main Street from the corner of High Street in Brattleboro, in May 1937. Photo taken by Arthur Rothstein, courtesy of the Library of Congress, FSA/OWI Collection. The first photo was taken in May 1937 by Arthur Rothstein, a prominent photojournalist who worked for the Farm Security Administration during the 1930s. Like the other photographers of this New Deal-era agency, Rothstein traveled around the country, documenting rural life during the Great Depression. In 1936 he visited Oklahoma, where he took one of the most iconic images of the Dust Bowl, and the following year he was in Vermont, where his images included this scene on Main Street in the downtown Brattleboro. The photo shows rows of cars parked along the street, with a mix of houses, businesses, and public buildings on the east side of the street. Probably the oldest building in this scene is the Centre Congregational Church, with its prominent steeple in the middle of both photos. The church was originally built in 1816, and was located a little north of here on the town common. However, in 1842 the building was dismantled and reconstructed here on this site, with a design similar to the old building. The new church was dedicated in 1843, and included a steeple and a columned portico at the front of the building. This steeple was destroyed in high winds in 1864, though, and it was rebuilt with a new Italianate-style design that omitted the columns at the front entrance. In 1929, the steeple was damaged in a fire, but was repaired and has not seen any other significant changes since the first photo was taken. The other notable building in the first photo is the town hall, which is on the right side of the scene. Built in 1855, this building saw a variety of uses, including as town offices, post office, library, and the police department, and it also housed commercial tenants over the years. In 1895, the building was renovated, and an 875-seat opera house was added to it. By the time the first photo was taken, the opera house had the less-glamorous name of Auditorium, and was used primarily as a movie theater, with the marquee advertising Night Must Fall, starring Robert Montgomery. However, the auditorium fell into decline as newer theaters opened on Main Street in the late 1930s, and in 1951 the town offices moved just up Main Street to the old high school, leaving this building vacant. It was mostly demolished two years later, and a W. T. Grant department store was built on the site. However, portions of the exterior walls of the old town hall were left standing, and were incorporated into the new building. 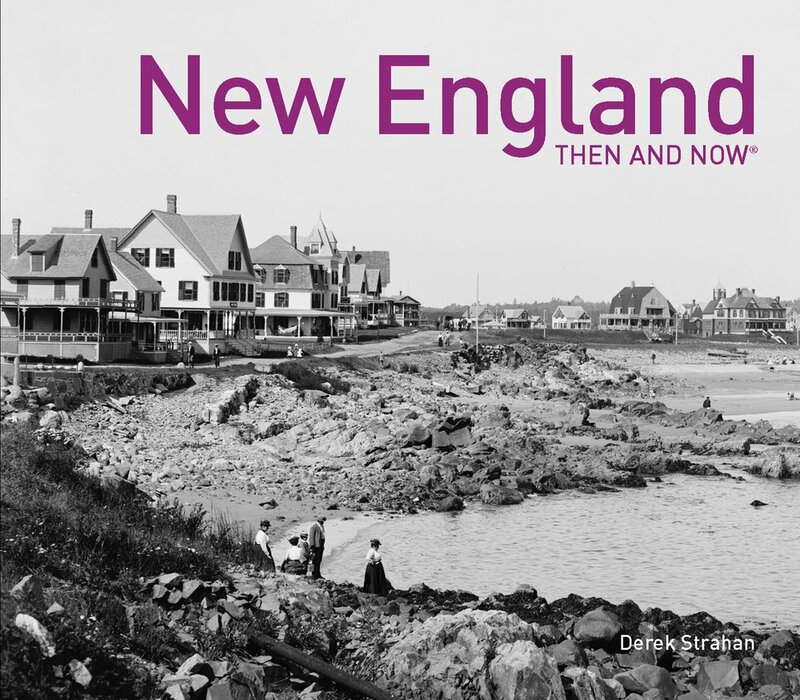 More than 80 years after the first photo was taken, this scene has not significantly changed aside from the loss of the old town hall. The W. T. Grant building that replaced it is still there, although the old department store has long since given way to new retail tenants. The church is also still there, as is the three-story granite building on the far right, which was built around 1850 and was later converted into the Paramount Theatre soon after the first photo was taken. Today, these 19th century buildings are now part of the Brattleboro Downtown Historic District, which was added to the National Register of Historic Places in 1983. 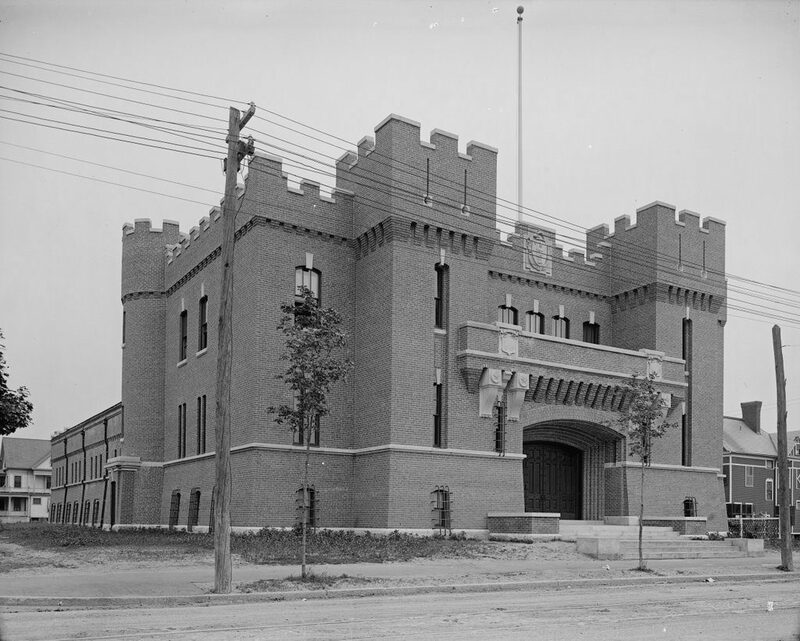 The National Guard Armory at the corner of Sargeant and Pine Streets in Holyoke, around 1907-1910. Image courtesy of the Library of Congress, Detroit Publishing Company Collection. 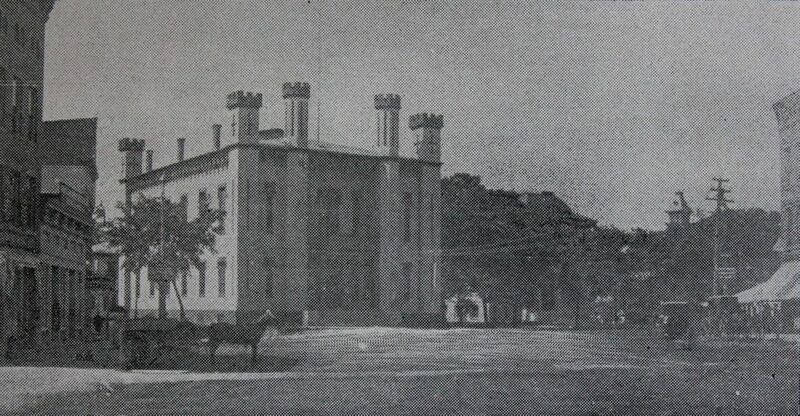 Around the turn of the 20th century, the Massachusetts Volunteer Militia – later known as the Massachusetts National Guard – built a number of similar, castle-style armories across the state, including ones in Boston, Springfield, and Worcester. The armories were designed to look imposing, and to represent the strength of the state militia, but the architecture was not entirely for looks. At least in the case of the Boston armory, the building was designed to withstand riots and other civil unrest, and its tower could be used to transmit signals to government leaders at the State House. 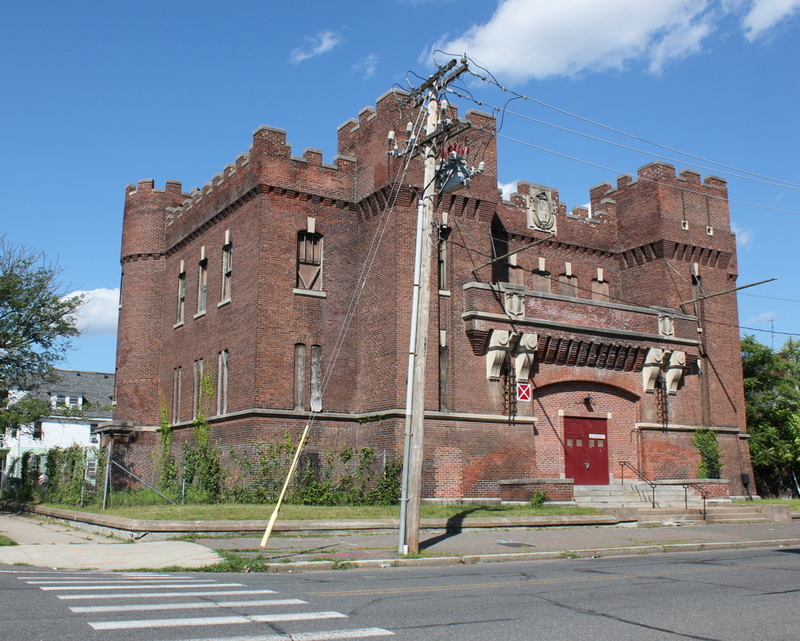 Here in Holyoke, the armory was smaller than those in the larger cities, but it had similar architecture, with turrets, narrow windows, and a crenellated parapet atop the building. It was designed by local architect William J. Howe and completed in 1907, and was supposedly based on the design of the 18th century Hawarden Castle in Wales. The building included the castle-like structure in the front, along with a drill hall in the back, and it was the home of the 1st Battalion, 104th Infantry Regiment. Only about a decade after the first photo was taken, the 104th Infantry went on to serve with distinction during World War I, suffering heavy casualties and earning the Croix de Guerre from the French government, marking the first time that an American military unit was honored for bravery by a foreign country. The armory remained in use for much of the 20h century, and in 1990 it took on an usual role as a temporary prison. At the time, the old York Street Jail in Springfield was dangerously overcrowded, to the point where inmates were being released early in order to make room for newly-convicted prisoners. Despite pleas from Hampden County Sheriff Michael Ashe, county and state officials were slow in responding to the problem, so in February 1990, Ashe took a dramatic step to call attention to the situation. Invoking an obscure 1696 state law that empowered sheriffs to do whatever was necessary to restore order in times of “imminent danger of a breach of the peace”, Ashe commandeered the National Guard armory in Springfield, over the objections of the armory commander, and housed 17 prisoners in the facility. The bold move quickly gained the attention of state officials, and the news story made headlines across the country. Although Ashe was threatened with criminal trespass charges, a judge ruled that the prisoners could remain in the armory, and the state soon made arrangements for the prisoners to be moved here to the Holyoke armory. The building served as a prison annex for most of 1990, housing nearly 70 inmates, but it had to close in late November after governor Michael Dukakis refused to provide more funding. This closure required the early release of dozens of convicts, but the armory annex was reopened the following year when the newly-elected governor, Bill Weld, authorized funding. The armory would remain in use as a jail annex until 1992, when the current Hampden County House of Correction opened in Ludlow. The historic building has remained vacant since then, and it is now owned by the city. Over the years, it has been the subject of various redevelopment proposals, but none have come to fruition and the building has steadily deteriorated. In early 2016, the drill shed in the rear of the building collapsed, requiring emergency demolition of the ruins. The front portion of the building survived the collapse, and it is still standing, but it is still vacant, despite efforts by the city to find a buyer for the property. The Mount Tom Hose Company building on Canal Street in Holyoke, around 1892. Image from Picturesque Hampden (1892). The Mount Tom Hose Company was established in 1851 as the first volunteer fire department in Holyoke. 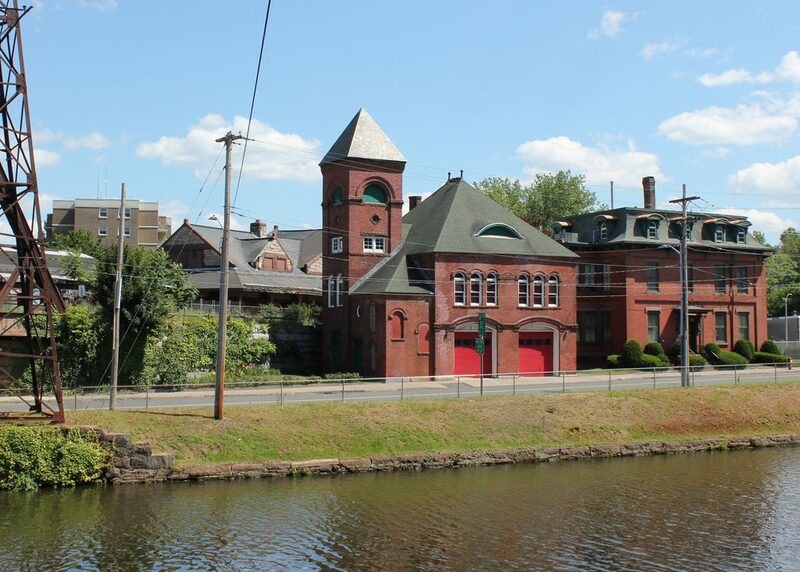 At the time, Holyoke was just beginning to be developed as a major industrial center, and the new fire department would protect both the rapidly-growing population as well as the many factories that were being built along the city’s canal system. The current Romanesque Revival-style building was completed in 1887 here on Canal Street, in a centrally-located area right next to the railroad station, which can be seen just beyond it to the left in both photos. The Mount Tom Hose Company later became Fire Station Number 4, and, although no longer in use as a fire station today, the building still retains its original exterior appearance from the first photo. Just to the right of the fire station is an earlier brick, Second Empire-style building. Dating back to the early 1870s, this building housed the offices for the Holyoke Water Power Company, which operated the city’s canals and provided electricity for factories and for municipal use. Originally, the building was only one story, but it was expanded in the late 1870s or early 1880s, with the addition of a second floor and a mansard roof above it. Although not noticeable from this angle, the building has had more additions since the first photo was taken, and it remained in use by the Holyoke Water Power Company until 2001, when the company was acquired by the publicly-owned Holyoke Gas & Electric. 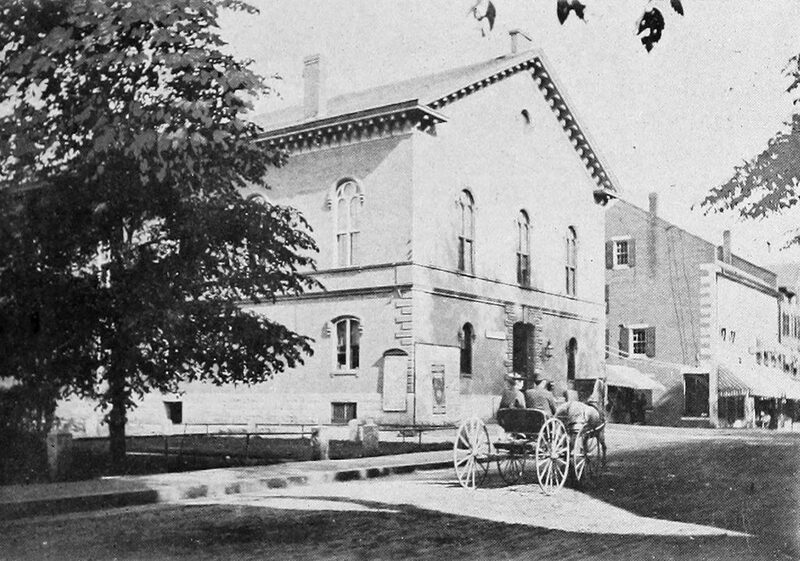 City Hall on Main Street in Northampton, around 1890. Image from Picturesque Hampshire (1890). Northampton’s city hall is perhaps one of the most unusual-looking municipal buildings in the state, with a distinctive Gothic-inspired exterior that stands about amid the more conventional brick commercial buildings that line Main Street. It was the work of William Fenno Pratt, a prominent local architect who designed a number of buildings in the area, and it was completed in 1850 as the town hall, since Northampton would not become a city for another 33 years. The building’s original layout included an auditorium on the second floor, which could accommodate over a thousand people. This space was often used for lectures, dances, and other civic events, and over the years a number of prominent people gave speeches here, including Henry Ward Beecher, Frederick Douglass, Ralph Waldo Emerson, William Lloyd Garrison, Oliver Wendell Holmes, and Sojourner Truth. Not long after Northampton became a city, this building played a role in the early political career of future president Calvin Coolidge. An 1895 graduate of Amherst College, he subsequently moved to Northampton and began practicing law, only a few years after the first photo was taken. In 1898, he was elected to his first political office as a city councilor, serving one term before being appointed as city solicitor. 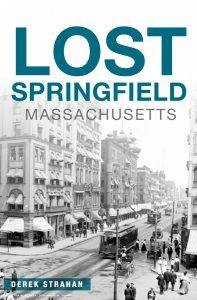 In 1904 he ran unsuccessfully for a seat on the school committee – the only election that he ever lost – but two years later he was elected as a state legislator. Then, in 1910 and 1911, he served two terms as mayor of Northampton, with his office here in city hall, before being elected to the state senate. From there, he held a succession of state offices, including senate president, lieutenant governor, and governor, and then in 1920 he was elected as vice president of the United States, before becoming president in 1923 upon the death of Warren Harding. Around the same time that Coolidge became president in 1923, Northampton’s city hall was the center of controversy here in his hometown. The eclectic design of the building had long been unpopular with many people, including then-mayor Harry E. Bicknell, who derided its “flip-flops and flop-doodles,” as he put it. However, despite calls to replace it with a modern, more conventionally-designed building, frugality ultimately carried the day, since it was far cheaper to renovate the old building than to demolish it and build a replacement. The renovations did include some significant changes to the interior, including converting the auditorium into offices, but overall the exterior remained largely the same aside from the wooden crenellations atop the towers, which had rotted away by this point. Since they were entirely decorative and sat atop towers that, likewise, served no practical purpose, these crenellations would not replaced until the late 20th century. Today, the building remains in use as Northampton’s city hall, still standing as an iconic feature on Main Street, with an appearance that is the same as it was over 125 years ago when the first photo was taken. The surrounding buildings have also changed very little over the years, including the 19th century commercial buildings on either side of the photo, as well as the 1872 Memorial Hall, located just to the right of City Hall. 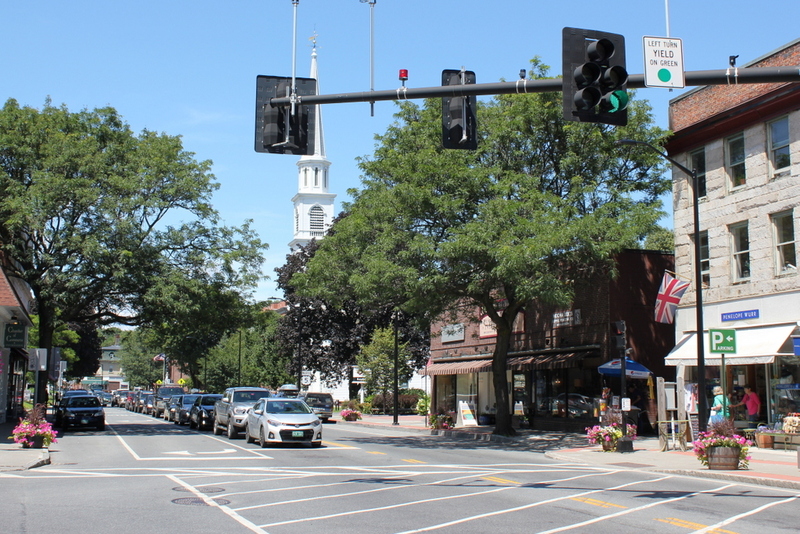 All of these buildings, along with the rest of the surrounding area, are now part of the Northampton Downtown Historic District, which was added to the National Register of Historic Places in 1976.